Robert Lawson spent much of his early life in Montclair, New Jersey, attending high school there before he went on to study illustration, a lifelong interest. During his time at what is now the Parsons School of Design, he met and married illustrator Marie Abrams, well known for her distinctive black and white style as well as for her four children's books which include Strange Sea Stories and Dragon John. The two remained married for their entire lives, with Abrams passing away one year before Lawson. He began his professional career in 1914 when Harper's Weekly published one of his poems. He continued to publish in such popular magazines as Vogue and Ladies Home Journal. Lawson also served in World War I as part of the very first U.S. camouflage unit which was assembled of various artists dedicated to developing an effective form of camouflage for soldiers. Throughout his career, he wrote and illustrated his own children's books as well as serving as illustrator for books by other authors. He took up etching later in life and was awarded the John Taylor Arms Prize by the Society of American Etchers. He died in 1957 at the age of 64. Collections of his work can be seen at the Free Library of Philadelphia and at the University of Minnesota as part of their Children's Literature Research Collection. Lawson was a student of dynamic symmetry as taught to him by artist Howard Giles but which was originated by Canadian artist Jay Hambidge. The concept of dynamic symmetry is to lay out a set of particular rules for composing a piece of visual art. Combining the mathematical concepts of root squares, root rectangles, the golden ration, and the Fibonacci sequence, it is thought that an ideal image might be composed. This theory was popular throughout the early 20th century, and while Lawson studied it, he was not as dedicated to the rules as some of Hambidge's devotees. Lawson's style was both realistic and whimsical. In his own work, he frequently preferred to show the story from the point of view of an animal, allowing readers to see images from a different perspective. Why else have you heard of Lawson? 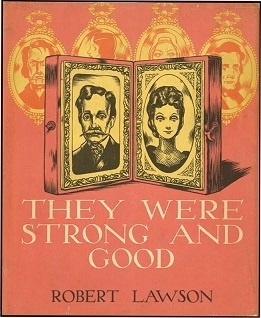 Lawson's They Were Strong and Good, a children's book about the lives of his parents, won the Caldecott Medal in 1941. Just four years later he was given the Newbery Award for his children's novel Rabbit Hill. 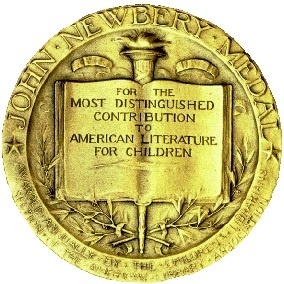 To this day he is the only person to have been given these two most prestigious American awards in children's literature. He has also illustrated some of the best and most enduring children's books: Mr. Popper's Penguins by Richard and Florence Atwater (which won the Newbery Award in 1938) and The Story of Ferdinand by Munro Leaf. Both Mr. Popper's Penguins and The Story of Ferdinand have been adapted into films. Mr. Popper's Penguins was adapted into a live action film starring Jim Carrey in 2011. The Story of Ferdinand was adapted into Ferdinand the Bull by Disney in 1938 and won the Academy Award for Best Short Subject (Cartoons). It was also adapted into a full length computer animated film that was nominated for the Academy Award for Best Animated Film in 2017. Lawson's Caldecott Medal winning book focuses on telling the story of both of his parents who may not have been famous figures in history but “were strong and good.” Collectors should note that the original 1940 edition bears some differences from newer, revised editions. The original includes some insensitive and outdated terminology and illustrations of both Native Americans and African Americans. Adults interested in collecting may want to search out the original but for parents looking to add a Caldecott winner to their children's book shelf, a later edition is better suited. This book was awarded its history-making Newbery in 1941 and tells the story of rabbits living near an abandoned house and a garden gone to waste. New people move into the house and the rabbits are left wondering whether or not the new homeowners will tend to the garden, allowing the animals to thrive, or if they are hunters who will seek the rabbits out for food. Considered particularly timely upon its publication, the book addresses post-World War II concerns of giving aid to war-torn countries as well as the the controversial topic of racial integration. Collectors should be aware that after 1970, editions of this book have been edited to eliminate illustrations promoting stereotypes. This classic book by Richard and Florence Atwater has a fantastic and enduring reputation due to its Newbery Award. The charming black and white illustrations perfectly complement this silly tale about a family who is still shocked about acquiring a penguin when they somehow get a female and end up with an entire slew of babies. This book has remained in print for ever since its initial publication. Try seeking out some of the older editions if you're looking for something besides today's ubiquitous mass market paperback formatting. This beloved story by Munro Leaf centers around a bull that doesn't want to fight and escapes his fate in the bullfighting rings to live his life out in the field with the flowers he loves. The Story of Ferdinand was a huge success, outselling even the juggernaut Gone With the Wind when they were both published in the same year. It is said that Leaf wrote the book simply to offer his friend Lawson a chance to illustrate something and build his reputation. The Story of Ferdinand has never been out of print and first editions have sold for more than $16,000.